Last time we introduced the phenomenon of uncontrollable factors as they exist within coal fired power plants. 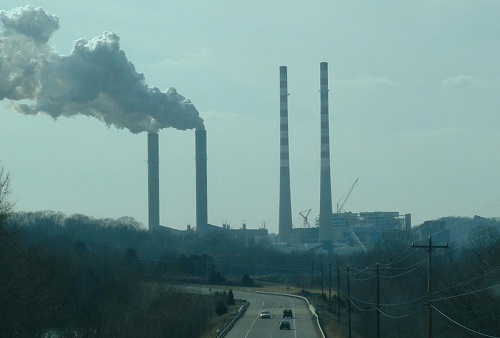 They inevitably result in lost energy in a number of ways, the most obvious of which is probably the smokestack, where lost energy is seen literally going up in smoke through the stack. When coal is introduced into a coal fired power plant’s boiler, it’s combined with air, ignited, and begins to burn. This burning process releases some useful heat energy to fuel our power grids, but the rest goes up in smoke through the stack, releasing the products of the combustion process, including nitrogen, carbon monoxide, carbon dioxide, and water vapor into the atmosphere. Next time we’ll discuss friction, another factor which results in power plant energy loss. I like to bring the outdoors inside by the inclusion of natural elements, lots of wood, stone, and gurgling water. I once lived in a house with a very impressive looking natural stone fireplace. On calm days it was a pleasure to throw on a few logs and start a nice crackling fire. But shortly after moving in I discovered that under certain conditions the smoke would back up in the chimney and actually flow back down into the house, creating a smelly, sooty mess. This usually resulted in me having to open all the doors and windows to vent the place out. The first time it happened I thoroughly investigated. 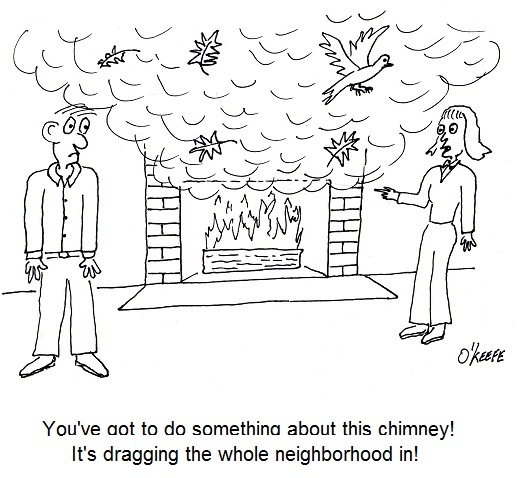 Was anything blocking the chimney? If not, what was the problem? A little outdoor surveying brought the issue to light. The fireplace chimney was not built high enough above the roofline, so that when the wind blew, it created downdrafts along the roof that worked against the smoke, forcing it back down into the chimney. The phenomenon at play with my stone fireplace is similar to one sometimes facing industrial ventilation applications. A fireplace chimney functions very much like an exhaust stack on a local exhaust ventilation system, its function being to efficiently discharge contaminants from the building, most typically in a vertical fashion. At a minimum, exhaust stacks must be designed to provide sufficient dilution of airborne contaminants when they are released into the atmosphere, while adhering to applicable environmental standards. Dispersion into the atmosphere scatters contaminating molecules into a huge playing field, the sky, thereby reducing concentrations to safe levels. Just as the vast ocean is capable of absorbing enormous amounts of pollutants from oil spills and the like, the atmosphere at large is equally capable. The distance between the exhaust stack and air intakes on the roof, and sensitive locations where windows and doors are located, keeping an eye on their separation distance from the exhaust stack. Exit velocity and vertical momentum of the contaminated air flowing out of the stack. These factors are addressed for various types of airborne contaminants through standards published by the National Fire Protection Association (NFPA), the American National Standards Institute (ANSI) in conjunction with the American Industrial Hygiene Association (AIHA), and the American Society of Heating, Refrigerating, and Air Conditioning Engineers (ASHRAE). Next time, we’ll take a closer look at their recommendations and the standards they’ve set up to prevent undesirable incidents such as the one I encountered with my natural stone fireplace.